An argument running through the 3d printing news that keeps coming up is whether 3d printing, when it becomes mainstream, will be in every house or in shops. The more people say 3d printers will be in every house, the more we seem to still be climbing the Gartner Hype Cycle. Here at 3d Printing Era, we think it’s unlikely everyone will own a 3d printer, at least in the next 50-100 years. To explore why, we can look to the past. Let’s look at two similar relevant technologies: band saws and personal printers. For woodworking, an extremely useful tool is the bandsaw. As an example, we could have picked CNC routers, lathes, belt sanders, or any other power tool. Through woodworking, crafters can create beautiful works of art, or incredibly useful furniture. If you looked around your house now, you’d probably find plenty of things made with a bandsaw, although you might not be able to recognize them. Hand crafted items underwent a huge boom in the early to middle 1900s, as powered tools enabled people to create things much faster than manual tools. But not everyone owned power tools. When individuals wanted to craft something, they did it with hand tools, or visited a local machine shop. Even now that the price of bandsaws has dropped to just a few hundred dollars for a starter, only hobbyists have bandsaws in their garages or basements. Most people buy what others create. The 1% rule of internet use states that 1% of the people create content, and the other 99% consume the content. About 10% may comment on the content, but the orignal act of creation is from 1%. Manufacturing follows a similar principal, but with even less creators. Not everyone owns a bandsaw because they’re not creating things. They consume the finished products without involving themselves in the act of creation. Even if everyone wanted 3d printed goods, why assume they want to print them? Hobbyists will join makerspaces, much like machine shops, and most 3d printed goods will come from large specialists, who sell to stores or direct to the consumer. Because of specialization of labor and investment in fine resolution machines, the product from specialist printers will be higher quality at comparable prices to owning your own 3d printing machine. This is already true, but will continue to be true, as 3d printing shops invest in new machines that allow printing in materials that are not feasible for home printers, such as metals or ceramics. When Gutenberg invented the movable type printing press around 1439, he revolutionized printing. Digital and Laser printers have furthered the revolution. But in 2009, only about 70% of households in the US said they owned a printer, and printers can be bought for $40. Accelerating growth might speed the acceptance process, but it will still be a long time. Although people own printers, it’s atypical to print out anything more than a few pages. If you wanted to read a book, it’s far more common to buy a physical copy or read it on a device rather than print your own. What 3d printed objects are similar to a few pieces of paper? What could someone print out, use for a bit and then throw away, as they do with most print jobs? Do we want the landfills of the future to be full of 3d printed plastic bits? Even print-on-demand has not grown the way publishers believed it would. The industry envisioned every bookstore owning a costly printer that could print a high quality book. Print on demand would shrink the need for large store inventories. Instead, most books are still printed and bound by huge printing companies. While machine shop equipment represents the low bound of 3d printing, home printers represent the high bound. But the high bound implies our culture would become even more disposable, unless 3d printers could recycle their printed products into new feed stock. 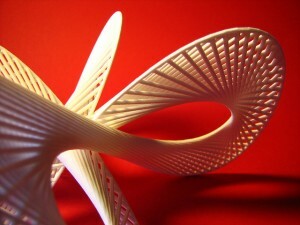 In the short term, or the next 10 to 20 years, we will see the world embrace 3d printing. But only hobbyists will own a personal 3d printer. Shops will spring up that are a 3d printing version of Kinkos. Staples recently announced it will have in-store 3d printers in Europe. Most 3d printing will be outsourced to other companies, unless design firms are engaged in rapid prototyping. Consumers will see an explosion of new ideas and products, as 3d printing allows a long tail for physical objects. Designers will design items that only a few hundred people may want, but because they can print them on demand, overhead prices are low. Mass customization will grow, in all realms of items. Fashion will see spikes of mock organic models and low-res chic. Supply chains will be disrupted, as more objects can be printed by local printer factories as customers buy them and same day delivered to stores to restock. Walmart might run their own printers and allow customers to print on their high resolution printers at low cost. Perhaps Home Depot will stock metal 3d printers customers can order prints from. But while most households will have 3d printed goods, most will not own their own printer.